Product categories of Rubber Lined Slurry Pump, we are specialized manufacturers from China, Rubber Lined Slurry Pump, Corrosion Resistant Slurry Pump suppliers/factory, wholesale high-quality products of Sludge Pump R & D and manufacturing, we have the perfect after-sales service and technical support. Look forward to your cooperation! 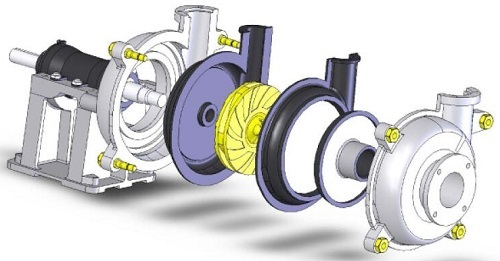 SME rubber lined slurry pumps are designed for heavy duty corrosive slurries. Rubber Material Alternatives: R08, R26, R33, R55. Even U01 polyurethane is available for pumps below size 8-inch.